Christmas is starting to pop up everywhere, from Christmas decorations to December daily preparations in the crafting and scrapping world. I'm making a plan for this year. I've got plans to do more journaling by hand this year to (hopefully) improve the chances of completion. 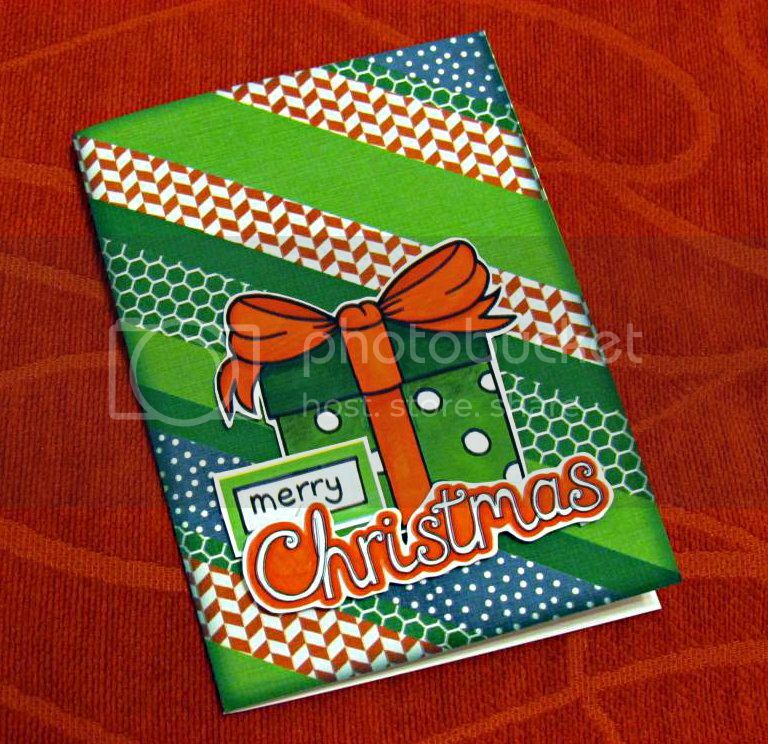 Sharing a card today I made using a background from the Holiday Faves 5x7 Mini Album Vol. 2 by Nettio Design sand the ultracute December Doodads by Kate Hadfield. The geometric patterns of the papers and the background stripes add a nice contrast to the dimensional doodles. I'm planning to make more cards using the mini albums backgrounds as well. Visit me over on Nettio's blog today. I'm guest posting while she is on vacation! If you want to find my previous post on the clean-a-thon, go here. Or click on the label – organization. If you would like to visit Nettio’s blog to find about more about the Spring Clean-a-thon, visit here. So I’m chipping away. Knowing that other people are also working on tackling similar cleaning tasks is motivating. Why do I want to get my digi stash more under control? Because although I still have 27 GB free on my external hard drive. I have more than that waiting on my internal hard drive, waiting to move so that all my supplies can live together in one place. And that just isn’t enough space! I also know that the kits that are on my internal drive are ones that I like more and are better quality than some of the kits on the external drive. I will admit that I thought for a while to just get a bigger drive to hold all of my stash. But I stopped and realized that this is the time to get myself in control. I am an e-hoarder and I really want to do something about it so that it does not take me so long to get everything backed up (and in turn I believe that I will back up more often if it is not a several day adventure) and so that I can find my stuff that I love! With that – how am I doing on my goals for this week so far? 1. My email inbox. I’ve gone through all the unread messages and unsubscribed from 3 mailing lists that had a lot of unread messages. I still have to go through the messages I’ve starred or marked to-do. 2. Backup. Hasn’t happened yet. 3. 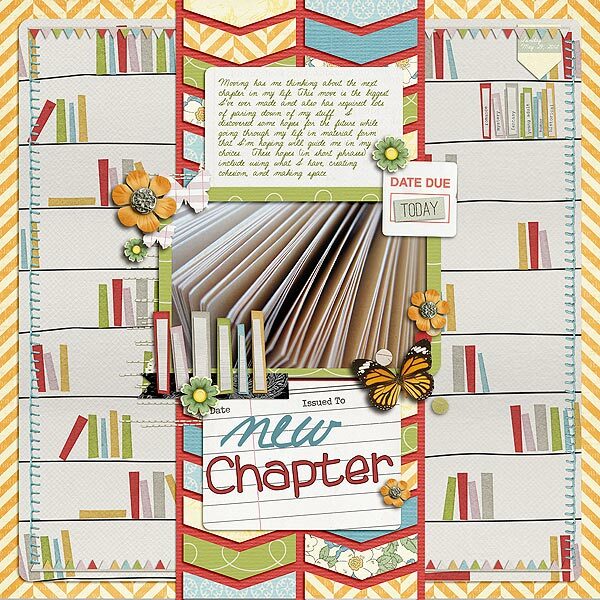 Get into a rhythm with organizing digi scrap supplies and photos. I’ve been working each day on my digi supplies. Moving some into an archive folder (I find it works better for me than if I straight delete). Haven’t worked on photos yet this week. I’m doing pretty well on getting rid of extra folders and I have moved some kits. Problem is: I think they are older kits with lower quality, so maybe they really weren’t taking up that much space. 4. Post about my progress – that’s me right now! Since the challenge is only for a week, I don’t want to set my goals too high, but I also want to use this as a chance to kickstart myself again. I was doing well with my organizing until about February and then I got distracted. Lynnette mentioned some surprises for people who follow along on her blog, so I’m going to update my status there as well. Wishing myself luck! And I used this kit by Elise’s Pieces – “Love is All Around.” It has great colors with pink, red, green, blue. I think it could match a majority of themes and photos. This little bear is turning five and it’s just crazy to look back at how much he and we have been through in that time. Something I realized from this layout. This bear has three layouts to his name over several years. Why? Probably because he is a Valentine theme and lots of fabulous digi kits are love themed and he is a natural. As I thought about this though, I realized that I have other “things” in my life that are completely undocumented. That’s not fair. I’m realizing how many holes I have in my pages and how I have multiple pages on some common topics. I think I’m going to start working on a missed layout list to start and help this situation. Do you have holes in your collection of layouts that are missing some important parts of your life? I’ve been working on writing more in a journal this year and so far succeeding. I feel like it has helped my journaling on my scrapbook pages as well by giving me ideas for pages, adapting words I have already written for my pages, or just made me less self conscious of what I write. The gold member kit at DST for March 2012 is a fantastic kit. Full of fun elements that any digiscrapper will love. I mean - a tablet element? It rocks. Even though I made a layout about writing with this kit, I’m planning to make a digiscrapping one in addition. I like the scratchy look to all the pieces of this kit.